When working in the BoldGrid dashboard, you’ll be using the Page Editor quite often. This is where you would make changes to your website pages and content. BoldGrid provides two main states for websites: Active and Staging. 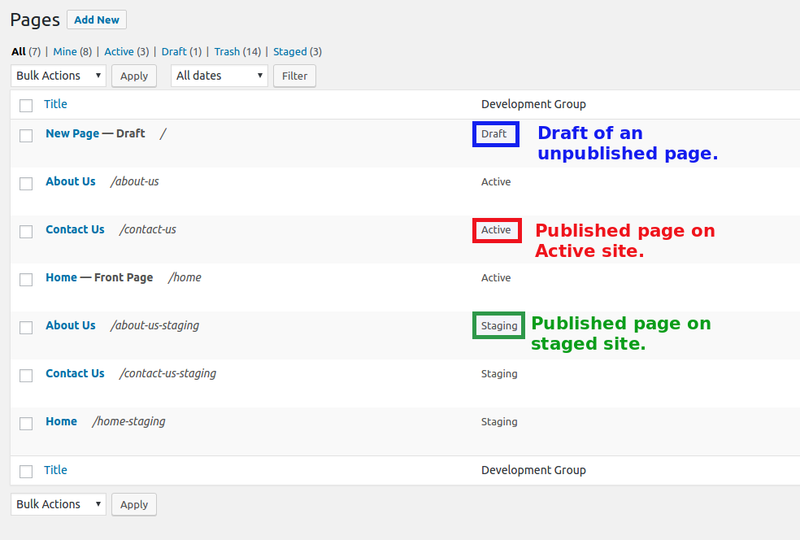 These sections are in a column called Development Groups when working in the Pages page in the dashboard. Below is a screenshot to show you how the different groups will appear. Utilizing page development groups is a powerful step toward getting the most out of BoldGrid. If you save a page as a draft, the page will appear labeled as “Draft” in the Development Group column. Pages saved as drafts will not be visible publicly. Pages can be published as Active and Staging and will be visible when visited through your Active Site or the Staging Site. It is always best to most of your editing and customization in the staging group. However, knowing which pages are in active and staging will help you keep track of where changes are made. Some developers copy active pages into staging in order to edit them without affecting the active site. The staging environment is also a good place to audition new looks and styles without affecting your active site.